A fantastic, retro gift idea for any old school kinda guy! 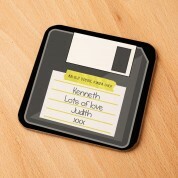 The nostalgic design features a floppy disc outline, and a sticky note on it which reads “An old school kinda guy”. It even includes the recipient's name and a short with love message of your choice. A brilliant and unique gift idea for someone on an Anniversary, birthday or at Christmas. 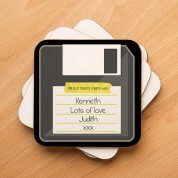 The personalised coaster is sublimated in house so every one is unique to the customer. At such a great price, we think this makes the perfect stocking filler when you are on a budget.